I can’t remember how to text to a cell phone from my computer and my neighbor is on travel, can you help me? What’s the rule for clothes lines in Cloverdale? These swarms of nesting breeding starlings are out of control – is there any information to available? What is the local contact information for Ms. Utility? I think it’s “Call Before You Dig”. Why can’t the HOA Board do anything about speeding in Cloverdale !! ? Does Cloverdale have an existing rule on how many proxies a homeowner can collect? Do you have any maps of the area? I’m new to the area and Cloverdale. Where is the dump and what are the hours? What are the new hours for the Rippon Post Office? Can the Secretary receive payment for their position on the Board? What are the differences between a policy a procedure and a resolution? Who is “Nasty Joe” and how to make him/her “un-nasty”? Can we amend our covenants and if we can how do we do that? My neighbor said homeowners do not elect the officers, is that really true? When and how do we ratify our annual budget? How do I obtain and update the community telephone directory? I am new to Cloverdale and I want to receive broadcasts, called eNews and I want to read the previous ones of the past, how do I do that? What’s the rule on antennae in Cloverdale? How much did the developer pay for the land to create Cloverdale? How come there are RVs in Cloverdale? Aren’t they in violation of our Covenants? Who do we contact when we observe street lamps out? Who do I call to replace my missing street sign? I’m having trouble with my Frontier connection/account – who can I contact? I’m concerned about the “floating zoning” discussed at our annual meeting [9.8.2012] how do I contact the correct office for further information? How do I get a password to our protected pages: Minutes, Community Directory and/or the Financial Calendar? My mailing address has changed several times in Jefferson County and I need proof of my current home address for my mortgage company, where do I go and/or who do I contact? I’ve been reading about the Chesapeake Bay Project and what the clean-up and protections should be; is Cloverdale located in a watershed? How do I get in contact with the WV Attorney General·s office? What’s the difference when the Executive Board has an annual audit or an annual review of the treasurer’s reports for Cloverdale·s financial records? Our governing documents state no open fires and I see homeowners burning their brush piles. How come? anything for those with disabilities. Where can electronic equipment like TVs and computers be dumped? Who snow plows our roads and how soon? Whatever happened to the Cloverdale newsletters and will we have them online? As a member/homeowner of the HOA can I really sue the HOA? Do we have a notary contact in Cloverdale? Why is the speed limit only 15MPH? Can I have a copy of the directory and area map of our community? Where are the meeting minutes located on the website? Can we bring visitors to any of our meetings? What is the height of a fence in Cloverdale? Who mows the common area(s)? What are the parking rules in Cloverdale? How do I find out about vandalism in Cloverdale? Who did the pictures on our website? Somebody said that the Cloverdale website was green · what in the world does that mean? All you need to do is find your carrier in the list below, and then use the pattern shown there to figure out your email address. If you want to send email to a neighbor’s phone, just ask them which carrier he/she uses. Cloverdale’s governing documents do not address clothes lines. Several of our homeowners do have them in their back yards. There is a load of information online, however several concerned homeowners have contacted Wildlife Services and obtained a guidance & information brochure – at this writing [2/4/2015] the Cloverdale Board of Directors are considering a program for emergency mitigation. Further information will be provided to homeowners. Please contact the Board of Directors for more information, and remember to register for Cloverdale eNEWS broadcasts. Call 48 hours before you dig. Miss Utility West Virginia can be contacted 24 hours a day, seven days a week by calling toll-free 1-800-­245-4848. Whenever possible, it is best to call between 7 a.m. and 5 p.m., Monday through Friday. Routine 48-hour notifications can be made via fax or e-mail. Accidentally digging into utility lines is extremely dangerous and can result in serious injury or death. Such accidents also endanger others and can disrupt essential utility services that people rely on every day. Be safe — protect yourself and those around you by calling 811 and avoid causing an accident. The Cloverdale Board follows the governing documents just like you do – currently there are NO speeding enforcements, policies or rules contained in our Declaration of Covenants, Conditions or Restrictions (DCCR) nor our Bylaws. The posted speed limit in Cloverdale is 15mph, the enforcement from police is null because our subdivision is posted PRIVATE ROADS registered with the county & state. However, there is a common sense answer: because we do not have sidewalks, pedestrians have no choice but to walk on the roads. A speed limit of 15 mph is more compatible and safe with a mixed use roadway shared by both pedestrians and motor vehicles. Think of our roads as an individual driveway that is 4 1/2 miles long. Through the courtesy of our local police they will patrol when called upon. The police cannot give a ticket for speeding on private roads -typically- it is considered 20 miles over the speed of 25mph – e.g. reckless endangerment and/or reckless driving and the police can indeed ticket speeders. In Jefferson County – most important would be using a laboratory known specifically for ONLY tests & results. There is a nominal fee for the test of about $30. Usually results returned in 24 hours. Call for further information. hmmmm, good question, Cloverdale’s governing documents, policy, resolutions and guidelines do not contain a restriction you may be referring to, nothing restricting proxy quantity by a single homeowner in Cloverdale has been located. However, should one or a group of homeowners canvas the community owner-by-owner and successfully collect for example 51% of the possible 137 proxy votes; that one or group of homeowners would certainly be accused of stacking the deck! There are quite a few maps available thru the link Jefferson County Planning & Zoning Department, too and including maps provided by Jefferson County geographic information systems, e.g. GIS. you will be able to select and view larger maps related to: zip codes, parks & trails, county & highway maps; Potomac-Appalachian Transmission Highline (PATH), Emergency Services – medical, fire and EMS, Police as well as Geology/Geography, Census, Election Districts and Planning & Zoning. Remember this for Holiday packages and mailings. The Postal Service is apparently trying to phase out our local Post Office, by keeping it busy we hope to keep it open. What is the big deal about the QRM Rule? The Qualified Residential Mortgages (QRM) rule is known as the Wall Street Reform and Consumer Protection Act, – DODD-FRANK ACT. At this writing (Oct. 2013) the QRM rule is being considered for amendments. Those amendments would include several points relative to homeowner associations and homeowner purchaser(s). Attorneys with Community Associations Institute (CAI) are following this proposal by representing HOAs in their best interests. Cloverdale is a member of CAI. IF the QRM Rule is passed; our Resale Certificate for Cloverdale would include a financial list containing a formal statement of stability which would be placed on a graded scale with mortgage lenders/banks and real estate sales agents to rank our Homeowners Association. (1.) for example: when ALL 137 annual assessments in Cloverdale are made on time (no delinquencies) Cloverdale receives a higher grade. Our individual property values would increase. Sales of homes would be quicker. (2.) Also the Federal Reserve Board would hold a mortgage lender liable for information – HOAs would be required (as a third party informer) to comply by submitting any material change (incapacitation, retirement, divorce, etc.) that would likely reduce the repayment of the mortgage, due to a decrease of future income; e.g the creditor must determine ability-to-repay on the basis of the borrower’s future rather than current income. The liability of third party information would cause a significant increase to the cost of a Resale Certificate as well as liability insurance an HOA is required to carry in protecting their officers elected by their peers to satisfy fiduciary responsibilities of the Association. DCCR: Article I Section 1.3 Definitions: Association. Cloverdale Heights Homeowners Association, Inc. a non-profit corporation organized under West Virginia Code Section 31-1-1. et seq. It is the Association of Unit owners pursuant to Section 3-101 of the Act. ARTICLE XVIII … the Cloverdale Heights Homeowners Association will be organized as a “not for profit” corporation under the laws of West Virginia. CAUTION: WV Code 31e(17) “Nonprofit corporation” means a corporation which may not make distributions to its members, directors or officers. Bylaws: Section 2.13 – Compensation. A Director may receive a fee from the Association for acting as such, as may be set by resolution of the Unit Owners, and reimbursement for necessary expenses actually incurred in connection with his or her duties. Directors acting as officers or employees may also be compensated for such duties. During an Annual Meeting (~2000-2005) this subject was discussed and homeowners chose NOT to pay an elected Director for duties while serving on the Cloverdale Board. Reimbursement for actual expenses will be paid to the elected Director or delegated homeowner with a valid receipt and/or invoice with the specific items’ cost. Rule or Regulation: A homeowner association’s board of directors adopts rules, regulations or guidelines to define desired behaviors and to set limits on allowable uses of the common elements and homes or units, architectural changes and the behavior of residents and guests. Some typical examples of rules include pets, parking, noise and use of HOA facilities. “Nasty Joe” is an extremely angry person. You know the type, he’s not happy unless he’s embroiled in an ugly battle. Joe will always point the finger at others, engage in loud, vicious and profane verbal [and/or e-mail] attacks and will never ever back down. He is a master at drawing people into a battle, because he knows he will always win and it fuels his fire. Unfortunately, Nasty Joe sometimes lives in a homeowners’ association. If you have encountered a Nasty Joe – you know it’s a no-win situation. These people take great satisfaction in targeting professional staff and members of an association’s board of directors. For these angry people, there’s nothing better than violating covenants and making life a misery for everyone involved . . . In order for homeowners to vote yes or no for an amendment of the covenants, the amendment must “do no harm” to existing residents. A discussion must include a constructive element that grandfathers those homeowners who have been provided waivers, permissions and/or a variety of special exceptions; consideration of policies, resolutions and even verbal agreements by the original developer and/or the Executive Boards over the years. In every instance homeowners need to be reasonable. Additonally: If amending the documents is too expensive, too time consuming, or not possible, the board could adopt a rule using the same language. While rules don’t have the same presumption of validity as covenants, the courts would probably uphold a reasonable and unambiguous rule. 5.) the newly elected board meets within ten (10) days, they then elect their officers. NOTE: terms are two years, for example in 2013 the homeowners will elect three (3) board members from their peers, then in 2014 the homeowners will elect four (4) board members from their peers. Within 30 days after adoption of a proposed budget for the Common Interest Community, the Executive Board shall provide a summary of the budget to each Unit Owner, and shall set a date for a meeting of the Unit Owners to consider ratification of the budget not less than 14 nor more than 30 days after mailing of the summary. Unless at that meeting a majority of all Unit Owners reject the budget, the budget is ratified, whether or not a quorum is present. If the proposed budget is rejected, the periodic budget last ratified by the Unit Owners continues until the Unit Owners ratify a budget proposed by the Executive Board. Ratification of Non-budgeted Common Expense Assessments. If the Executive Board votes to levy a Common Expense assessment not included in the current budget, other than one enumerated in Section 17.2 of this Declaration, in an amount greater than fifteen (15%) percent of the current annual operating budget, the Executive Board shall submit such Common Expense to the Unit Owners for ratification in the same manner as a budget under Section 17.5. Cloverdale’s Directory is available online or one can be surface mailed to you – the Directory is available to MEMBERS ONLY – solely for the convenience of our community and is NOT to be distributed in whole or part to anyone outside of our community for any purpose. (26) No television, radio, or other type antenna or satellite dish shall be erected on any portion of a lot except behind the rear line of a residence and not more than 25 feet from the rear building line of the residence. However, in 1996 the Federal Communications Commissions (FCC) passed a law “Over-the-Air-Reception Devices (“OTARD” rules)” carrying a clause for the placement of an antenna to be in the position of reception, Cloverdale recognizes this law and initiated the act of reasonableness, though no formal amendment was enacted at that time. Q: Does an association have to amend its declaration to comply with the FCC Rule? A: No, the Rule simply preempts existing covenants. Associations should, however, revise their rules and guidelines to comply with the FCC Rule and to address legitimate safety issues and the use of masts. Q: What can an association do in a planned (single family) community to preserve the aesthetic value of the community and still comply with the FCC Rule? A: Since homeowners in a planned community generally own the lot and everything on it, they will have the right to install an antenna anywhere within that lot, absent specific safety and historic considerations and any valid restrictions adopted by the association. If the homeowners own their own roofs, then they would be permitted to install antennas on the roof. However, if homeowners can receive adequate signals from satellite dishes installed on the ground and ground installation does not unreasonably delay or increase the cost of installation, rooftop installations may be prohibited. Therefore, it is important to specify the preferred locations in the association’s rules regarding satellite dishes. Q: What can an association or homeowner do if there is a dispute over whether a particular restriction is valid? A: If the association defines the restriction as safety-related, it is valid, unless a court or the FCC determines that it is not safety-related or is not the least burdensome way to ensure the safety goal. Associations or homeowners may also petition the FCC or a local court (county or district) for a ruling to determine whether a particular restriction is permitted or prohibited under this Rule. While the association is waiting for a ruling, it cannot require an owner to remove the antenna or otherwise enforce its rule. If an association has a “highly specialized or unusual” concerns about antenna installation, maintenance or use, it may apply to the FCC for a waiver of the Rule. (2) No house trailer or mobile home or any similar item shall be stored in the open on any lot. (4) No temporary building, trailer, basement, tent, shack, garage, barn, outbuilding or other building erected in the course of construction shall be used temporarily or permanently as a residence on any lot. “no, it does not include RVs”, and permission was granted. Must NEVER be used as a permanent residence by any Cloverdale homeowner(s). Must be current with WV registration and license when owned by a Cloverdale homeowner while stored on their own paved property. Record the plate number on the light pole(s) and call the local number for Potomac Edison on you electric bill. Frontier representatives are available 24 hours a day, 7 days a week to assist you. Contact the Planning Commission Monday through Friday, 9:00 a.m. to 5:00 p.m.
How do I get a password to our protected pages like our Minutes, Community Directory and the Financial Calendar? Select CONTACTS>ASK YOUR QUESTIONS from the menu bar above, be sure to include your current information – shortly thereafter you will receive an e-mail with a password. Passwords are ONLY available to members of Cloverdale’s HOA. clean-up and protections should be; is Cloverdale located in a watershed? Jefferson county wide program will pay half of your septic pumping bill up to $150. For this program fill out the application send it to the Eastern Panhandle Conservation District, once it is approved you will receive a packet in the mail and then have your system pumped; submit your bill for reimbursement. This program will be unavailable after funds have been exhausted. How do I get in contact with the WV Attorney General’s office? Good news – help is available at the new WV Attorney General’s satellite office for Consumer Protection in Martinsburg – they opened May 15, 2012 and attached is the basic mortgage complaint form and requirements for your documentation. The staff will assist you with this form should you have problems. The office is an outgrowth of a recent settlement between states and five mortgage lenders over mortgage and foreclosure abuses, Bank of America, JPMorgan Chase, Wells Fargo, Citibank and Ally Financial. West Virginia consumers will receive nearly $34 million from the settlement, and many of them live in the Eastern Panhandle. such as vehicles, appliances, contracts and/or agreements that may be questionable. when we buy a home in a Cloverdale? include savings for future big-ticket items like our school bus & mailbox shelters and their roofs, gutters, sidings; and don’t forget repaving our 4.5 miles of roads — which means you, the homeowner, will not be hit unexpectedly with a special assessment or loan payback when these big-ticket items need to be replaced in a few years. The major difference is cost – an audit is roughly $6,000/year and a review is roughly $750/year, at this writing. In 1997 the Executive Board proposed and finalized an amendment recommended by the Examiner specifically Bylaws Section 2.2 Article VII making changes in the text for “review by a Certified Public Accountant” of financial records annually. burning their brush piles. How come? NOTICE: burning anywhere in Jefferson County, you must first contact the Jefferson County Communications Center at 304–­725-8484 to obtain the current burning regulations and to register the address where you will be burning. does not mention anything for those with disabilities. In 1998 the Executive Board received the following response from McCune, Bittorf & Layva, attorneys at law concerning this issue: Article X.1(15) Reasonableness is required – Inasmuch as the Americans With Disabilities Act would prohibit the discrimination against persons with disabilities, the prohibition of electric/motorized wheelchairs would constitute unlawful discrimination. several other questionable sections of Article X of the Declaration specific to Sections 10.1, 10.8, 10.15, 10.16, and 10.22 all are relative by considering the "Rule of Reasonableness"] Also read April 2011 Persons with Disabilities Within an Association thru Rees Broom, attorneys at law, Community Associations Institute. At this time printed copies of a newsletter, when published, are surface mailed to your home. UPDATE: May 21, 2012 HOA Meeting – the Cloverdale website will take the place of newsletters; select NEWS and/or select from the above menu bar – duplication of volunteer duties and time have been lessened. Also, Cloverdale broadcasts “eNEWS” may be sent to members’ e-mail addresses to highlight time-sensitive issues for your attention. Certainly, however suing the HOA is essentially suing yourself; the HOA must obtain legal council at your expense and “if” the HOA wins the case you may be responsible for the HOA recovery of attorney fees, court costs, filing fees and more – remember, your Annual Dues is budgeted to handle retaining legal council. Do we have a notary in Cloverdale? In 1989 the developer, Marcus Enterprises was required to post the speed limit – because there were no County guidelines/ordinances it was determined a rural limit. US 340 did not exist at that time. In late 2011 Cloverdale invited, by requirement, the Jefferson County Sheriffs Department to patrol Cloverdale. By mid-2012 the Eastern Panhandle Organization of Homeowners Associations (Cloverdale is a member) circulated a request to WV state legislators and the Department of Transportation inquiring how to enforce traffic violations – the statutory speed limit is twenty-five miles per hour (25mph) in a business or residential area – legislation to allow law enforcement to freely patrol HOAs and issue traffic violations has been initiated. The assumption that HOAs roads in Jefferson County are private is a misnomer – those roads are public thoroughfares. The community directory is provided only to Cloverdale homeowners and is password protected on this website – contact the Board and/or webmaster for access; the directory is also printed and surface mailed to homeowners once a year. However, the Cloverdale community map is available on this website Cloverdale Map. Or use the menu bar and choose ABOUT>CLOVERDALE MAP on the drop-down selections. The archived scanned minutes are password protected – available at MEETINGS>MINUTES on the drop-down menu bar. Not a definitive collection. Certainly, the governing documents do not prevent visitors from attending, however while following Roberts’ Rules of Order visitors, e.g. non-members, may attend but may not participate during the meeting. It is customary for visitors to step outside or into another room/area during financial discussions. It is a meeting of the members. Also, by arrangement through the Executive Board, one or more guest speakers may be invited to Cloverdale meetings to share various types of information. 2. Property fences are four (4) feet tall. 3. Fences installed prior to 1997 were grandfathered. Each year the Executive Board contracts with a company to mow common areas. At this writing, Homeowner Ronnie Fellers has been contracted. However, many years ago our membership agreed to “mow to the edge of the road” on each of our lots by cutting back on mowing contract costs. Special event parking along common areas is acceptable. However, your own vehicle parking is permitted only within your own property. All MEMBERS‘ vehicles must have current WV tags & registration. There is no parking at the entrance to Cloverdale – all vehicles will be towed at owners’ expense. our local police, sheriff and state troopers. 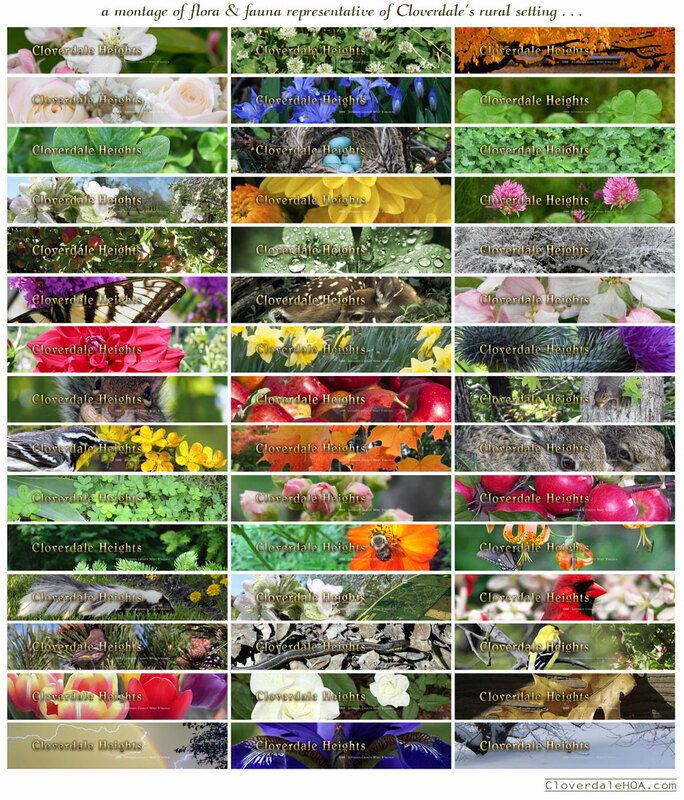 Our homeowner and webmaster – Nance Briscoe – a montage of flora & fauna representative of Cloverdale’s rural setting by a variety of candid homeowner photographers. Each time a visitor selects a link a random image should appear. There are more than forty (40) images to enjoy. (opens in a separate window) In some months, holidays may show a stationary image. Somebody said that the Cloverdale website was green – what in the world does that mean? e.g. wind power, generated is sufficient to power more than 300 homes a year! What’s better than leaving the least footprint on earth while enjoying the internet?